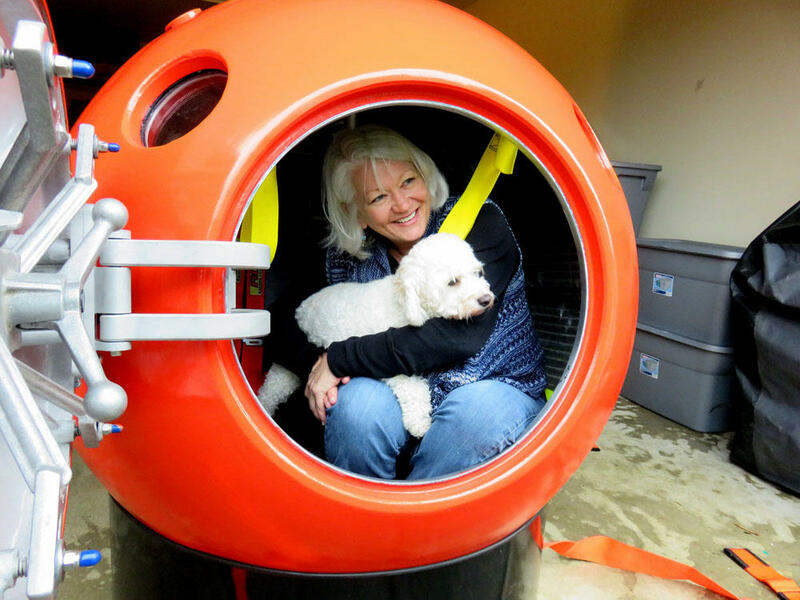 Jeanne Johnson of Ocean Park, Washington, is the first U.S. buyer of a tsunami pod sold by Mukilteo, Washington-based Survival Capsule LLC. 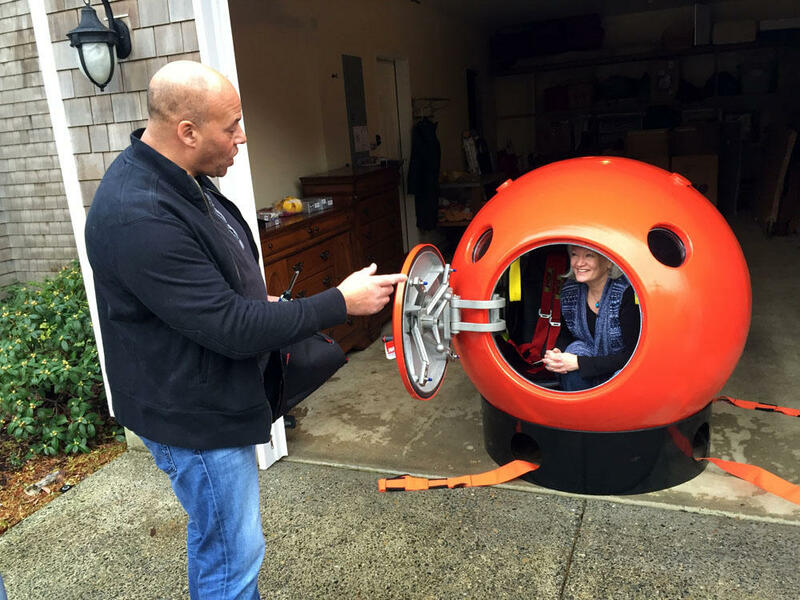 Survival Capsule President Julian Sharpe gives some tips to his first domestic U.S. customer Jeanne Johnson. Survival Capsule customer Jeanne Johnson, right, lives three houses in from the dunes and the Pacific Ocean surf on Washington's Long Beach Peninsula. Geologic records show the Cascadia Subduction Zone offshore is capable of generating a massive tsunami. The first U.S. buyer of this technology resides in Ocean Park, Washington. 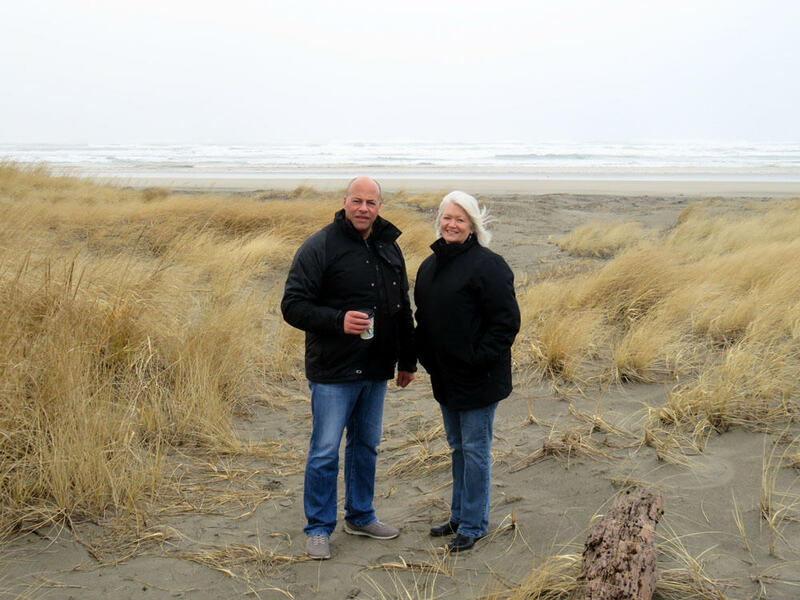 Jeanne Johnson just recently moved from the Seattle area to what she calls her "dream home" at the beach. It's about midway up the sandy, flat Long Beach Peninsula. "When I decided to move to the ocean into a tsunami zone I felt like I should prepare,” Johnson said. "People panic and I don't want to be caught in the panic,” Johnson said. A bit of internet research led her to a new option: a survival capsule -- a bright orange, high-strength floating metal ball. She has taken delivery and is now deciding whether to tether her capsule in her herb garden or keep it in the garage. In any case, Johnson wants her dog to join her if and when “the Big One” comes. "My model is big enough for two people to be buckled in like a pilot's seat,” she said. "I thought, 'Well, what happens now if a tsunami comes?’" Sharpe said. "I just thought it's going to be a disaster because I've got four sleeping kids,” Sharpe said. “If it comes at night, the lights are going to be out. You don't necessarily know where you're going. You can't see the wave, how far it is. So I thought it would be great if I could design something to throw the family in and ride it out. That's where it all started." Sharpe's company's initial sales have been to Japanese customers -- eight capsule kits so far. He anticipates local governments in Japan could become a major customer base along with private sales along the U.S. West Coast, Gulf Coast and East Coast. "The target customer is the person who lives on the ocean who cannot vertically or horizontally evacuate,” Sharpe said. That's potentially a lot of people as long as they're willing to pay the price. Sharpe says the two-person survival capsule starts at $13,500. A four-person model lists for $17,500. Six, eight and ten-person models are for sale as well. While the inspiration for the product was tsunami survival, Sharpe said his company's capsules are now drawing additional interest from coastal residents worried about hurricanes. "Rather than evacuate from hurricanes and be 200 miles away while the hurricane decides it wants to go in a different direction leaving their home vulnerable -- or business vulnerable -- to looting, they want to stay at home and have a tsunami capsule as a last line of defense," Sharpe explained. "I would hate to be bounced around in that,” she said. “I'm too old. I'm 80 years old. I don't know that I would care to survive a tsunami." The City of Long Beach, Washington, is using grant money to design an armored, manmade hill that could be used as a tsunami evacuation platform for at least 850 people. Bena favors building this, but as you maybe can tell she's fatalistic about her own chances.